In my quest for an exhaust that looks better than the stock can I have set my eyes on Austin Racings GP3 belly exit system, with the GP1R can. But every now and then I find random people claiming that big V-Twin engines does not like shorty exhausts. 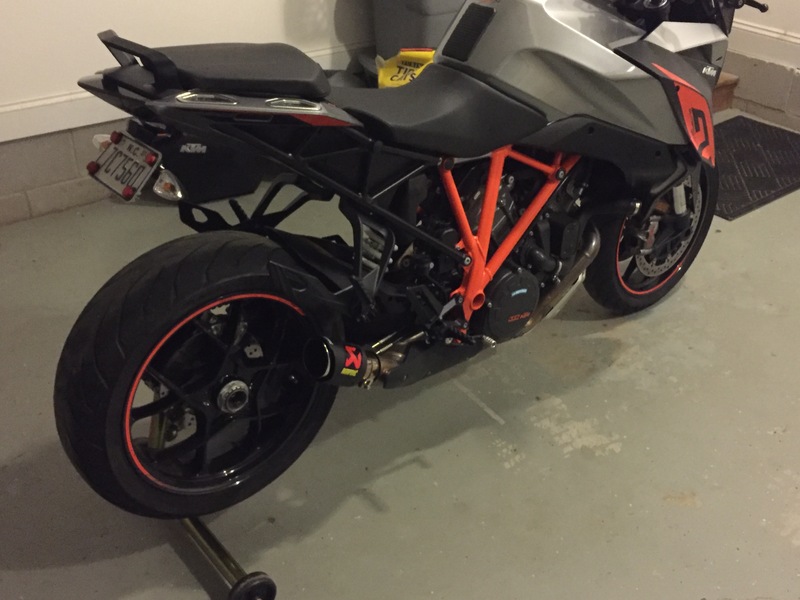 Austin Racing on the other hand claims that their system will work just fine on the Super Duke, even with the stock KTM map, and that their exhaust system has inserts that creates adequate back pressure. Anybody that has some knowledge to ad in this matter? An exhaust's length, volume and the distances from the exhaust valves to all the changes in diameter and the very end determine what effect it has on the particular engine it's being applied to. A shorty exhaust will make it run differently than a longer one. As each exhaust pulse moves toward the exit, a negative pressure wave is created at each change in diameter (and the end cap) that moves toward the exhaust valves at the speed of sound. If it's arrival is timed right, the event(s) help pull a subsequent exhaust pulse out of the cylinder, increasing performance and power. Hopefully the engineers that designed the particular exhaust you're interested in performed the calculations to make their pipe have a positive effect on power and know at what rpm those effects kick in. A shorter exhaust will have less of those negative pulses than a longer one, so you gotta hope they were timed right to take advantage of sonic extraction. Hope you're less confused now than before. At least I know more of the possible problems with a shorty. But as far as performance and calculations from Austin Racing goes, I would just have to trust their statement that it will all be good. Some people just slap a pipe on with no idea how or if it's supposed to improve performance. When you change one thing, you change everything, so direct comparos are not easy. One of the bike mags tested expensive systems against stock and saw very little if any performance improvement with no other changes. The biggest difference was more sound and lighter weight. A freer-flowing exhaust will help if used with other changes such as fueling and intake mods, but will not do much without those other changes. I don't know about less smooth, but the powerband and it's fat part will be in a different rpm range with a shorty than something longer. The speed of sound is fairly constant, so the length, junctions and volume are the way to adjust when those "suction" pulses hit the open exhaust valve. The same principle works with intake tuning: for every vacuum pulse created by the downward motion of the piston, the length and junctions of the intake system bounce positive pressure waves back that when timed correctly, helps stuff more mixture into the chambers, a sort of "free supercharging". I have a GP3 with GP1R can. I can't comment on the performance of the system alone as I did the airbox, SAS, PC V, all the Rotty dongles, HealTech ESE, and pollution delete all at the same time. All in all, the power was raised and delivery was smoother. Also a noticeable decrease in heat coming out of the engine. I have not posted it yet, but it is for sale(carbon fiber can with orange tip). I have a Bodis cat delete w/ Graves can on I like the looks of more. Performance of the two is the same. A more common story is the shorty with the cat deleted sounded to much. Id do a 1290 with the cat and a shorty exit but get self mapping tuner on board asap, spend the 700e on the pcV or another self tuner and have the power and smoothness and a little stealth when you need. I put the fake one that they sell on eBay on mine. It isn’t quite as clean as the AR, but it is still a very clean look and pretty much exposes the entire rear wheel. IMO looks decent. It is basically a short straight pipe, with the cat still on. Truth be told they probably have $30-$40 dollars in material costs in the thing (and no R&D), if that. Probably just an automotive exhaust tip with a shroud. But it is still a lot cheaper than a true name brand slip-on. I mainly got it for the aesthetics and a bit more volume. As far as power, I feel no discernible difference from the stock exhaust. I am sure there are some differences in the power curves if you put it on a dyno and actually tested/compared, but nothing I can notice in real world riding. You still have the exhaust valve/flap servo, which creates back pressure. It is just the right amount of volume for my taste. At a cold start it sounds kinda like a Harley, but after it warms up, it simmers down a bit. At speed/higher rpms I really like the sound. I also have the fueling dongles installed which makes it easier/happier in a higher gear/lower rpm for those times you don’t want to be too loud in a neighborhood. I wasn’t trying to put a bunch of money into this bike in aftermarket parts, like I have before, and it already has enough power for me. So this was an economical solution. Last edited by PC1978; 04-13-2019 at 09:52 AM. The aftermarket exhaust manufacturers used to include dyno chart overlays in their print ads so you could see the actual effects of their products, but with regulations (of-road only and such) and the motorcycle makers catching up on their breathing homework, it's hard to say what, if any, effect an aftermarket pipe has on a particular engine without doing your own before-and-after dyno comparisons.